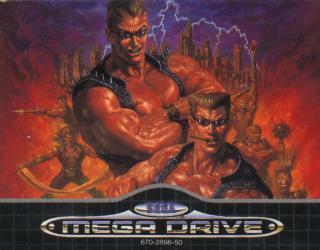 2-player simultaneous action and great graphics contribute to this all-around fun fighting game. 1 Extra 3 Continues Here is a rather simple method to gain a few extra continues and get futher in the game. Start a one player game and go through it as normal. When you are on your last continue with only a little bit of energy left, press START on controller 2, kill off your first player and play as the second player with a full load of 3 extra continues. Now, you can get futher in the game. sends in two mercenary mutants to clean out the place. 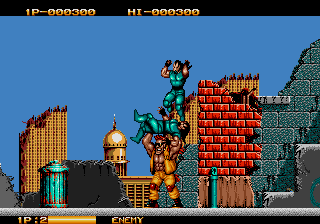 The horizontal beat-and-up game, similar to shinobi, but with only fighting and some impossible moves(hold up a car and dump it to people) :). I would said this to be a good game, but not great at all, as the graphics there is not very well and the enemy is repetitive, and somehow, the game is quite hard, so not very enjoyable. Nevertheless, the dual-player modes could make you "rejoyes" the game. I found this game amusing for about half an hour, then I got bored and started playing Toki again! Dunno if it's the case with this but in the original game there was a cola machine at the end of each stage that you could beat the crap out of and drink the cola to replenish energy. However if you beat up the machine without drinking any coke you were awarded a 1up or something. this is a good game very good game.a beat them up game yeaaa. I remember one of your enemies attacked you by taking a crap on you. And the whole picking up taxi cabs and throwing them at your enemies? Honestly, I think that the creators might have dropped acid or something. 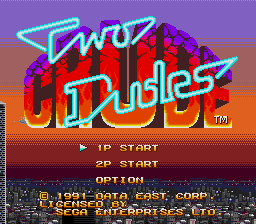 I didn't notice the crapping parts on this game perhaps it should have been named 2 Vulgar Dudes! Good beat-em-up for the genny and a good laugh. 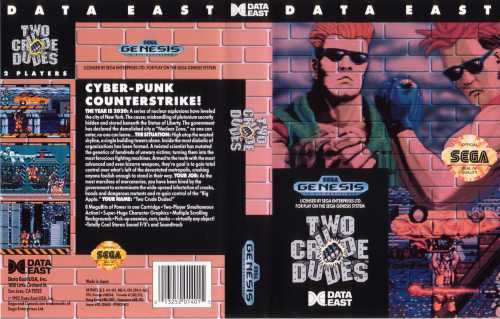 I use to own this game, and I have to say, this game had some major "Dude" Action in it. 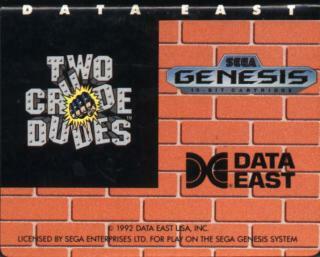 But I can't help but wonder, what if the"Two Crude Dudes" Teamed up with "Bad Dudes" from NES. Could such an onslaught of Dudicular behaviour be permitted? I project that such an attack on our Dude Detectors would most likely overload our ability to excrete with any accuracy, or even be able to maintain an erection. Further more, I don't recommend anyone have these two games in the same house, let alone the same state, Province, country, or planet. The Amount of Dudes would certainly be catastrophic. Could Earth handle this much dudes, bad or crude? 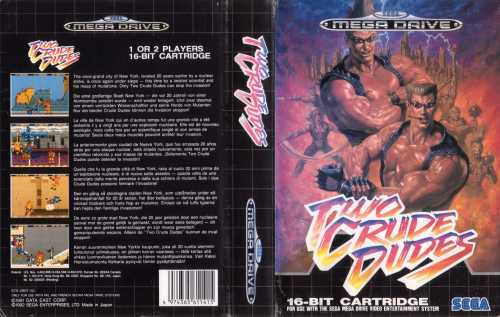 Now It comes two the big question, which game had more "Dude Action"???????? The scary thing is I own both these titles. But I keep them locked in my Cellar, in a box. Dare I unleash the wave of Dudeness? Someone better stop me.... I , I can't hold it back any longer, AHHHHHHH! AHHHHH! It is done. 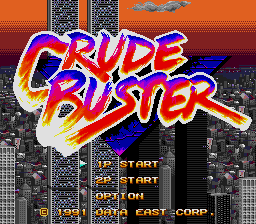 Look, I am so strong now with the power of Crude and Bad Dudes, I can lift cars, and yes, Tanks two. Let see if my skills with knifes have improved... Yes they are razor sharp. The president has been kidnapped by ninja's. Are you a bad enough dude to rescue the president.